Are you creative and love to write? Did you know you can get paid to write greeting cards working from home. If you love to write but don’t think writing greeting cards is for you then check out other work at home writer jobs. Ready to get started learning how to get paid to write greeting cards? Read on to gain some insight into how you can start earning money from home. How much will I get paid to write greeting cards? This varies greatly by company but most of the companies listed below pay between $30 to $300 per accepted submission. Check with each company below for their rates before submitting. You may find some pay a lot better than others but are harder to get submissions accepted while others pay lower but accept more submissions. What are some tips to get started? Research what is already out there by going to look at the greeting card aisles next time you are out shopping. You can get inspiration from other cards but remember not to copy other people’s work. Make sure you read all of the submissions guidelines at each of the company websites so that your submissions comply with their guidelines. If you submit ideas in the wrong format, they are likely to be ignored even if they are a great idea. Don’t get frustrated if your ideas are not accepted right away. Keep trying with different ideas and different companies. What resources are out there to get started as a greeting card writer? 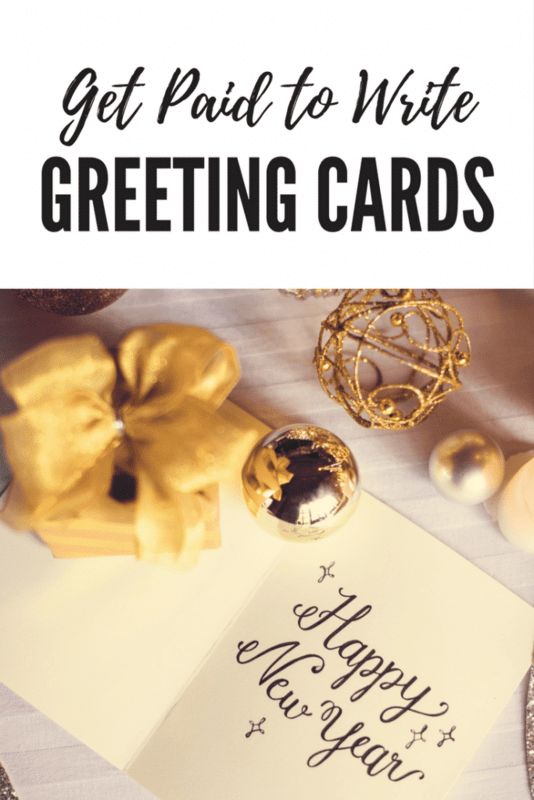 If you are new at writing greeting cards there are some great resources out there to help you get started. This interview on Creative Writing Now has some great tips for beginners from someone that has been doing this for a while. She recommends in her interview using the Writers Market which has a section on writing greeting cards or The Christian Writer’s Market Guide for the Christian market. If you are interested in writing funny greeting cards then check out the How to Write Humorous Greeting Cards kindle book. Which companies pay for greeting card submissions? Looking for a work from home job but don’t feel like this is a good fit for you? Check out all the categories of jobs over at the work from home companies page. This post may contain affiliate links but I only share work from home information I believe valuable to my readers.